I’ve spoken in front of a lot of franchise brands, but the folks from Anytime Fitness were different. I was told they’d be an enthusiastic group, but I’ve seen that before. I was told they’re health freaks, but they’re not my first client in the fitness industry. What really distinguished this crowd was something much more unique — their tattoos. Specifically, their Anytime Fitness tattoos. Thousands of people worldwide have inked the Anytime Fitness “Running Man” on their bodies. This includes members, employees, franchisee owners and corporate staff. This has become such a thing that Anytime Fitness sets up a tattoo station at their annual franchise convention, and people line up to get them. The headquarters in Minnesota even has a dedicated tattoo room. The company reimburses anyone up to $100 for getting the tattoo. Brand loyalty is one thing. But tattoos? That’s commitment. These people are literally walking billboards for a corporation. Keep in mind that many of the people choosing to get an Anytime Fitness tattoo aren’t already covered in ink. For some people, it’s their first and only tattoo. A member from the Concord Township franchise in Ohio – the club with the most inked members – said in an interview, “This is my first tattoo. I never thought in my life that I would be a person to get a tattoo.” This is a common sentiment among many others who also get one. Why would so many people permanently connect themselves to this brand? After my presentation, I asked. (See the above video.) Their responses went beyond physical fitness. That didn’t surprise me. Culturally, Anytime Fitness is about something bigger than sculpting bodies. Many in my audience nodded in agreement when I explained they’re not in the fitness business; they’re in the self-esteem business. It’s no coincidence that their parent company is called “Self Esteem Brands.” For these people, Anytime Fitness is more than a gym or a business. It’s a lifestyle. 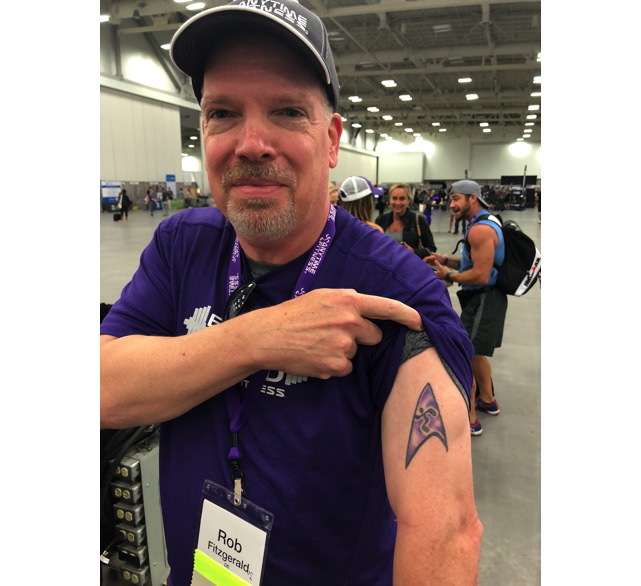 If anything, the tattoo is less about how people feel about Anytime Fitness and more about their renewed love for themselves. They look great, they feel great, and they associate these results with the physical space and motivation the brand provides. For them, the “Running Man” isn’t a logo for a corporation. It’s an adopted symbol of self-worth. Chuck gave me a tour of the headquarters. I could feel these values infused into every aspect of the place. The physical environment was inspiring. People were laughing. There was lots of communal space, game tables, and of course, a fitness center. Images abound reminding corporate staff of their larger purpose. These guys don’t just talk to the talk, but really live and work by their values. It wasn’t lost on me that this was more than a cool place to work. It was also ground zero for the world’s fastest growing fitness chain, and consistently one of the highest ranking franchise concepts available. It’s what a modern day thriving company looks like. Chuck explained to me that he and Dave had no formal business leadership training. They’ve been figuring this out as they’ve gone. Their instincts and commitment to their values seemed to have paid off. Whether by design or default, the two leaders have managed to create the holy grail of business – a cult brand. Lot’s has been written about cult brands and the characteristics that define them. These are companies that have a base of almost fanatically loyal customers. Their name alone inspires a feeling: comfort, excitement, familiarity, non-conformity. You know the brands. Starbucks. Disney. Harley-Davidson. Apple. You probably have some smaller brands in your neighborhood that have major local followings. Here in Los Angeles we have Pink’s Hot Dogs and Diddy Riese Cookies. Their lines at midnight are as long as they are at noon. Cult brands offer more than a product or service. They provide customers with an emotional experience. For Disney, it’s a sense of wonder and excitement. For Harley –Davidson, it’s power and adventure. Lululemon sells workout clothes but also a sense of inspiration and physical confidence. 7-Eleven sells good, affordable coffee, but Starbucks provides a feeling of sophistication – a feeling for which people will pay a premium. These feelings are deliberately created by these brands and are an essential part of their marketing. It’s one way they distinguish themselves from everyone else on the block. Anytime Fitness creates a feeling you don’t get in most gyms. Typical fitness centers provide access to equipment and machines. These places can feel cold and, depending on the culture of the gym, intimidating. 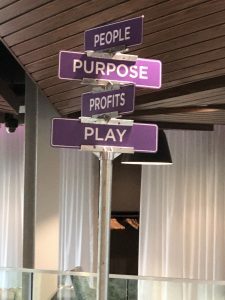 Anytime Fitness creates a sense of belonging. Members are welcomed by staff who offer ongoing motivation and work-out tips. The space is smaller and less crowed. It feels like a premium, boutique experience. People know each other and offer mutual encouragement. Members talk about being part of a fitness family. Everything about the experience makes people feel good. The brand builds people up on the inside, not just on the outside. When a brand makes people feel good, it also leads to an emotional connection to the brand itself. That’s the basis of loyalty. They have a great story. Advertising is about products and services. Stories are about people. That’s why they get our attention. Who doesn’t love to hear about Walt Disney’s rise as an animator, or the two Steves working in a garage to create the first Apple computer? An interesting history that humanizes the company is very compelling. It connects us to the people behind the company. 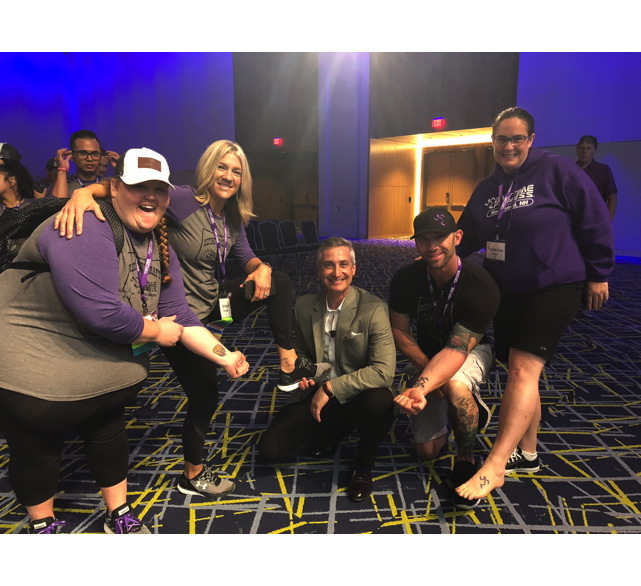 Anytime Fitness proudly shares their story of two scrappy fitness center consultants who put a twist on the gym experience and built a people-oriented company culture, resulting in the largest fitness chain in the world. It’s a cool story. It makes you root for these guys. But the story-telling doesn’t stop there. Their website also has a page devoted to telling the stories of the Anytime Fitness community. Unlike traditional testimonials that speak to the greatness of the company, in this case, the company celebrates the accomplishments of their members. Each experience is another chapter in the Anytime Fitness anthology. These stories put people first. Consumers really like that. Rallying around a sport team is fun. It connects us to other people. My brother-in-law isn’t just a Raiders fan; he’s part of the Raider Nation. That makes going to games a communal experience he really enjoys. People like a sense of connection to others. They need it. Great companies form communities around their offerings. They don’t just work to build connection between themselves and their customers. They also try to connect customers to each other. Harley-Davidson organizes huge group rides and gatherings. When you buy a Harley, you also gain admission into a proud, leather-clad community of bikers. My daughter feels the same way about American Girl. Having the doll connects her to other kids who also have one. She’s been invited to American Girl birthday parties and playdates. Anytime Fitness members aren’t just joining a gym. They’re also joining an energetic community of like-minded people with similar values and goals. Their website even says, “If you’re looking to join a supportive, welcoming gym community, with people of all fitness levels who want to see you succeed, you’ve come to the right place.” Again, the focus is on the people, not just products or services. A “gym community” is much more than a gym alone. Anytime Fitness is the alternative to all the sign-you-up-and-forget-you gyms. They’re different than “the guys across the street.” Competitors have big facilities. Anytime Fitness remains intimate and less crowded. Other gyms are too big to get to know members. These guys build relationships. Read the online reviews of members and you’ll see how often they contrast Anytime Fitness with the gyms they used to go to. Chuck and Dave designed the entire concept to be different than everyone else in the marketplace. That distinction defines their brand. They have clear purpose and passion. Every company needs to make money. The best do so by making a difference. Apple clearly wants to innovate cool gadgets to make life better. Facebooks wants to connect people. REI promotes outdoor adventure and stewardship. TED spreads ideas. All brands have mission statements. Cult brand live their missions statements. Anytime Fitness is obsessed with both physical and mental health. They build people on the inside by helping them with their outside. As I prepared for my presentation, attended their convention and visited their headquarters, it became clear to me why these people get out of bed each day. 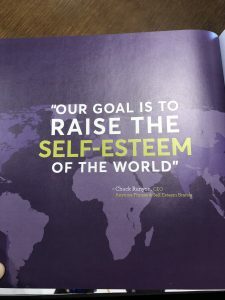 They have deep sense of “why” – which is building others’ self-esteem. Members feel that, and it’s why they remain loyal. Visual branding matters. Logos and images are part of a company’s identity. The Nike swoosh, the McDonald’s M, Twitter’s bird (named “Larry” after basketball legend, Larry Bird) – these images need no words to indicate who or what they represent. They’re simple, unique and easy to incorporate into larger designs. Logos become badges for brand loyalists. One of my favorite bands when I was a teen was The Ramones. Three times I saw them in concert, and all three times I bought a Ramones t-shirt. I’ve been to other concerts where I loved the band, but not their shirts. Great brands need to have great images in order for followers to display them. Their brand is bigger than the company. No one pictures an office building in Burbank, CA when they think of Disney. In fact, they don’t even think of Walt Disney himself. Instead they envision characters and magical places. If the company were to cease to exist, the public would still able to use the concept of Disney to label a very specific type of entertainment. Disney fanatics aren’t loyal to the suits running things in Burbank. Their connection is to the idea and the feeling of Disney. Some of the Anytime Fitness franchisees and managers I met made reference to Chuck and Dave. Most, however, expressed a love for what the brand represents – concepts such as persistence, hard work, health and family. Anytime Fitness is as much an idea as it is a company. This is no accident. 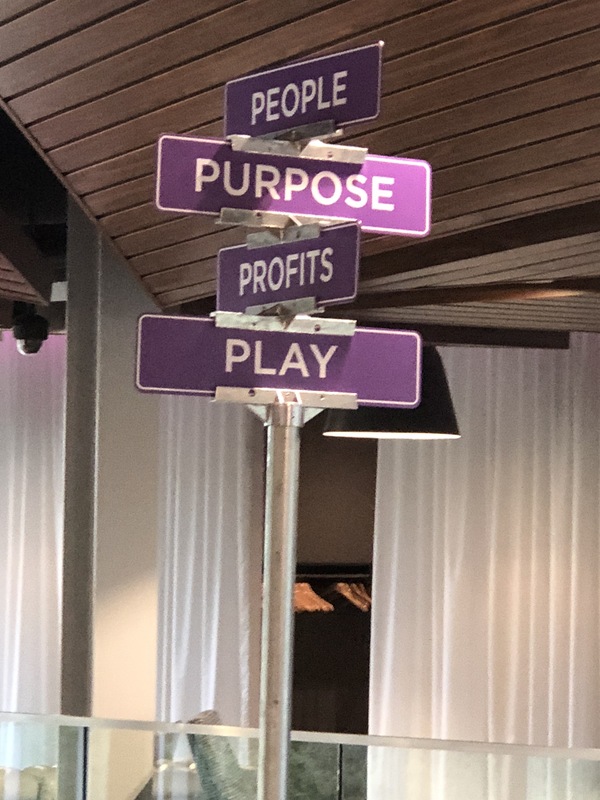 Chuck and Dave have put all their energy into promoting their values of People, Purpose, Profits and Play. No small decisions are made unless they support these big ideals. This is precisely how they’ve created something much bigger than themselves. Anytime Fitness is so much more than a beautiful glass building in Minnesota. Cult brands don’t necessarily have all of these things going for them. What they do all have in common is a relationship with the customers. They provide something that’s become part of the human experience. They’re no longer purveyors of products and service. They’re organizers of meaningful communities. They make money by making a difference. Their customers are loyal to the point of feeling ownership in the brand. They care about what happens, and hold the company accountable. Who knows how many people have actually joined Anytime Fitness because they saw the Running Man inked on someone’s ankle? But tattoos aren’t the goal. Loyalty is. The company’s success is less about making a mark on people’s skin as it is making a mark on their heart.